As kick-off approached in the Derby della Madonnina, Milan’s Ultras unfurled a tifo depicting Hell Boy bringing his fist down on a pile of skulls through which an Inter scarf was laced. “Send them to hell,” was the request made by the Curva Sud to Milan’s players. Looking at the banner, Inter probably thought it can’t get worse that this. It’s been a tumultuous month for them in which the flames ignited by dressing room strife, the stand-off provoked by the decision to strip Mauro Icardi of the captain’s armband and premature exits from the Coppa Italia and Europa League threatened to engulf their season. 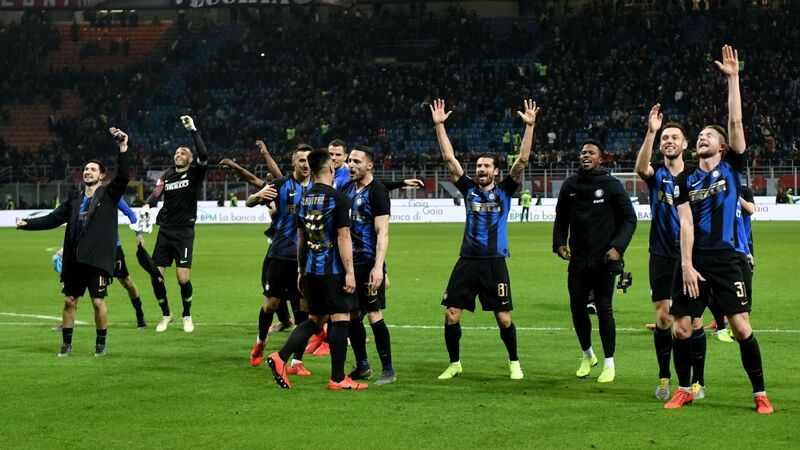 However, quite unexpectedly, Inter climbed out of the fire, winning a thrilling match 3-2 and overtaking their rivals in the table by doing the double over them for the first time since 2012. AC Milan’s ultras send a message to Inter fans. Milan had won five games in a row and would have boasted the league’s best record in 2019 with a victory. The impact of January signings Lucas Paqueta and Krzysztof Piatek meant the momentum was indisputably with them. Milan were on the up and Inter on the way down. Icardi, who scored the stoppage-time winner in this fixture in October and has five goals in his last four appearances in the Madonnina, was watching from his penthouse, its roof terrace overlooking San Siro. Without him there was nothing for Milan to be scared of — or so the perceived wisdom went. Rino Gattuso warned his players Inter were “not dead,” and he was right. They came alive, freezing hell over with an early goal that set the tone for the game. Milan have been vulnerable to goals from crosses originating on their left side this season and so it proved again. But the real conundrum for Milan was the position of the anarchic Matias Vecino, who lined up in a nominal midfield role in a 4-3-3 and kept popping up in the half-spaces either side of Tiemoue Bakayoko. The shape was closer to 4-4-2, with Vecino playing just off central striker Lautaro Martinez and the understanding between them was to be decisive. The third-minute opener was indicative of that. Rather than go for goal himself, Martinez smartly headed a cross back into the middle of the six-yard box for Vecino to smash into the net. It was the quickest goal in the derby in eight years. Vecino’s well-timed runs almost produced a second before the half-hour mark when he arrived at the same time as teammate Roberto Gagliardini, the pair of them queuing up to punish Milan, only for him to fire wide. Milan, meanwhile, lacked balance when they had the ball. Piatek touched it just eight times in the first half. Suso, who has scored and assisted just once since November, was peripheral. Bakayoko’s driving runs were all too easily snuffed out because of the poor movement in front of him which meant Milan’s most promising early forays came almost entirely down the left through Paqueta and Hakan Calhanoglu. The benefits did not outweigh the costs, though, and it came as little surprise to see Paqueta substituted at half-time. Milan hit back almost instantly through Bakayoko and never gave up. Not even when Paqueta’s replacement, Samu Castillejo brought down Matteo Politano just inside the penalty area. A missed Marcelo Brozovic spot kick cost Inter dear in the first leg of their Europa League tie away to Eintracht Frankfurt. Perhaps mindful of that the Croat deferred to Martinez on this occasion, who slotted home to restore Inter’s two-goal advantage and cap a fine individual display. Perhaps too similar to partner Icardi, the 21-year-old has stepped up in his friend’s absence and while he may not score as many — not yet anyway — his combination play continues to catch the eye and makes Inter less one-dimensional. Another set-piece enabled Milan to close the gap through Mateo Musacchio and they weren’t done yet. Gattuso went all-in, switching to two up top with Patrick Cutrone flanking Piatek in attack. It almost paid off as Milan came within a whisker of equalising not once but twice in added time, first through Castillejo and then Cutrone whose shot was blocked on the line by Danilo D’Ambrosio. The Italian celebrated as if he’d just scored a goal for Inter. It was a hard-fought and deserved win for the Nerazzurri. A potential turning point not only in the context of Inter’s own problems but the other results this weekend. Roma and Torino lost, Atalanta dropped points. It’s hard to think of things going better for them. Inter now have a six-point cushion in the race for Champions League qualification and the international break will be slightly more serene for it.